A little-known field of ophthalmology soon will get work space in Ann Arbor that matches the stature a University of Michigan team has achieved. A $1.5-million grant awarded in October by the Harry A. and Margaret D. Townsley Foundation will help U-M build a state-of-the-art Ophthalmic Imaging Center in the new Kellogg Eye Center under construction. Scheduled to open in 2010, it will house six camera rooms, a photo studio, a waiting area and a larger work space. Researchers in the US have developed a technique that could allow neurologists to draw a detailed wiring plan of the mammalian brain by inserting genes coding for fluorescent proteins into mice. 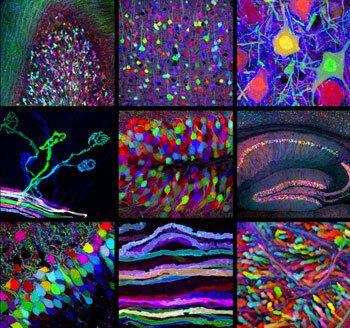 Dubbed ‘Brainbow’, the system reveals individual neurons within the nervous system in up to 90 different colours. Digital imaging technology has been used in forensics since at least 1992, yet until now there has been no practical instruction available to address the unique issues of image processing in an everyday forensic environment. Photoshop CS3 for Forensics Professionals serves the everyday, real-world needs of law enforcement and legal personnel dealing with digital images (including both photos and video stills). “For years, images of this man sexually abusing children have been circulating on the Internet,” Interpol chief Ronald Noble said in a statement. What Lies Behind Our Nose? Scientific data are the currency of science, but they often buy little understanding outside science itself–or even outside the narrow confines of a single scientific discipline. But when data are brought to life through images, illustrations, computer graphics, and animations, they can stimulate excitement, awe, new ways of looking at things, and, above all, a broad appreciation of even the most esoteric scientific information. After writing two books on the topic of artists and eye disease, the Stanford University School of Medicine ophthalmologist decided to go one step further and create images that would show how artists with eye disease actually saw their world and their canvases. Combining computer simulation with his own medical knowledge, Marmor has recreated images of some of the masterpieces of the French impressionistic painters Claude Monet and Edgar Degas who continued to work while they struggled with cataracts and retinal disease. Can mathematics explain the art of Jackson Pollock? Can it be used to authenticate paintings of uncertain provenance? Case Western Reserve University physicists address these questions in the current issue of Nature.